My plans last week got screwed up by weather, but the rain and cooler temps were a welcome relief, and with nearly an inch of rain on top of what we got the week before, river levels have stabilized a bit and water temps have come back down. 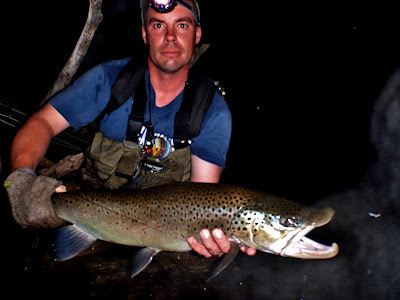 Northern Michigan is again having cool nights so the fish and fishing should improve. 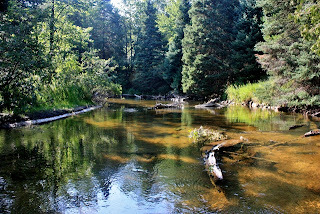 I had planned on hitting the North Branch Au Sable river this weekend with the Fall River bamboo. 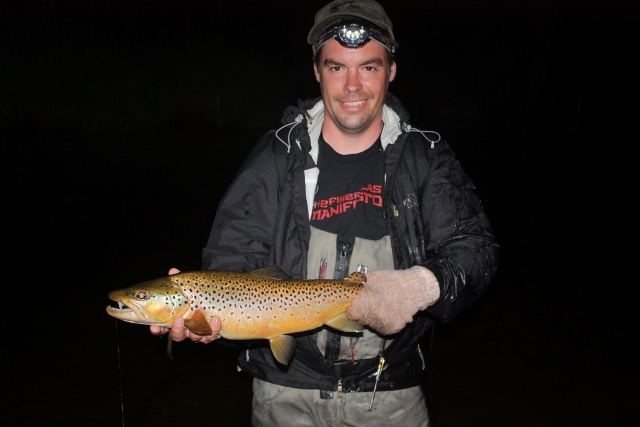 Early in the week I heard that Mike Schmidt of Angler's Choice Flies was possibly going to be up to fish the trico hatch on the North Branch and we might be able to fish together. This scenario actually played out, minus the tricos. I camped with Mike and his brother John, we fished and hung out. It was a great time. Mike got his brother John into a few fish first thing in the morning on olives, but the tricos never showed up (it was too cold) and being post-front the fishing was tough all day. Still, it was a beautiful day, we caught a handful of gorgeous fish, and it was nice to cast on a wide-open river and stretch the bamboo a little. With the continued chill Sunday morning Mike decided to make the long drive home early. 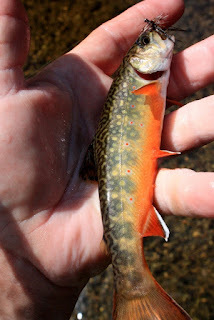 I decided to drive north to one of my brook trout streams and see if I could do any better. Being the second day post front, the morning warmed a lot faster. I got into a pod of about 20 fish feeding on emergers right off. I hooked up on several, but was fishing a size 24 BWO emerger and couldn't stay pinned. Not long after this the tricos started in earnest. 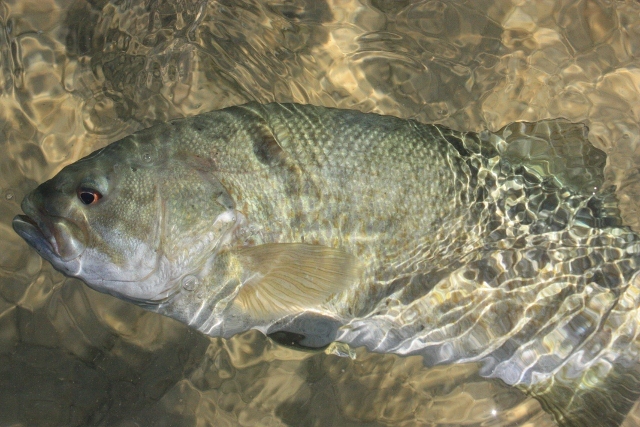 Not a blanket hatch, but enough to bring out almost every fish in the river. 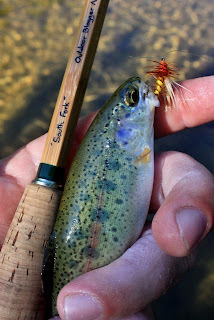 I didn't have any actual trico flies with me, but made do with some black midges and landed about a dozen fish. When the tricos quit so did the fish, so I drove to another spot, ate lunch and then fished hoppers. I caught fish for the rest of the day. 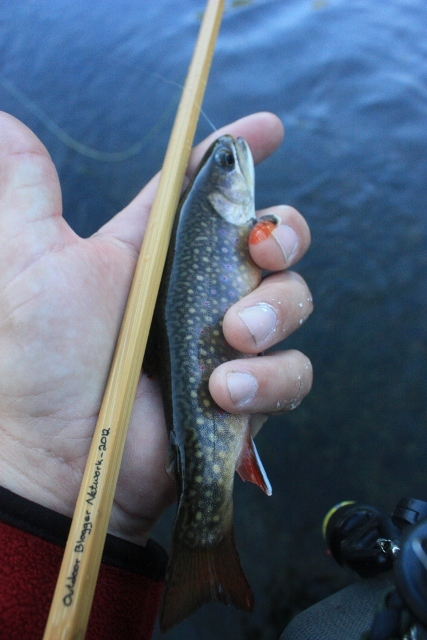 No monsters, just a couple dozen more beautiful little brookies that destroyed several of my hoppers before the day was over. 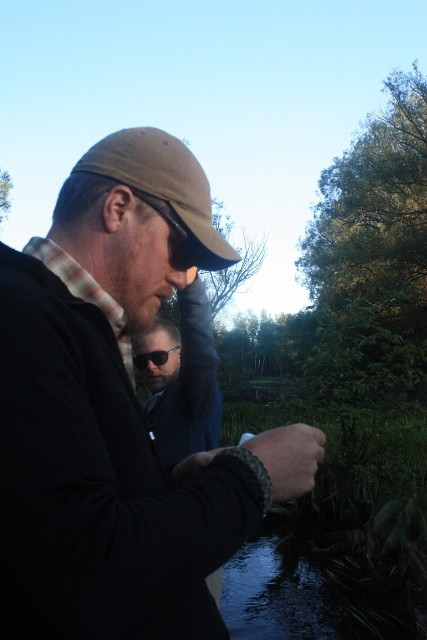 The weekend was a dirtbag classic, I had a great time fishing with Mike and company, and I hope we get to do it again some time. Okay, I've got to run. Enjoy your week, and fish if you get the chance. 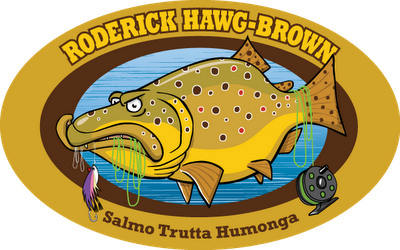 Most of you know Roderick Hawg-Brown, or perhaps not. After all, if you never have met him personally how could you know him. I have met Mr. Hawg-Brown on at least one occasion, and so if you haven’t had the displeasure (he doesn’t like you) I would like to introduce him to you. I donned a snorkel and a Babel Fish and plunged beneath the waters to endure this irksome conversation (you should see how I took notes). What you have to realize about Mr. Hawg-Brown is that he is surly, abrasive, evasive, invasive, a loner, but a the same time shy and reclusive. He has a lot of “ives”. Sort of like a skin-rash for Scottish trout. While our conversation was combat”ive”, I did manage to wrest some answers from him. Look familiar? I doubt it. 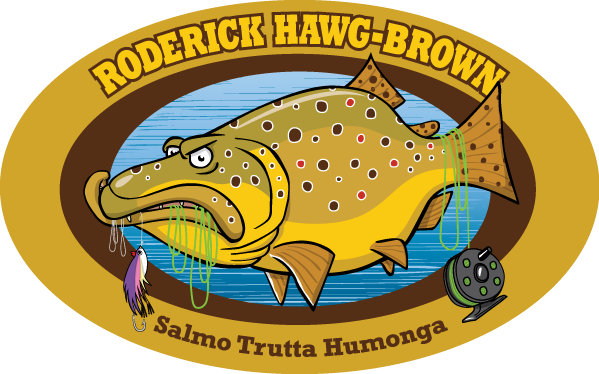 FR: Mr Hawg-Brown… may I call you Roderick? RHB: No. And while you’re at it, keep your distance or risk losing a few digits. I’ve not fed since a scrawny muskrat passed by my cut bank two days ago, and I’m in a mood. 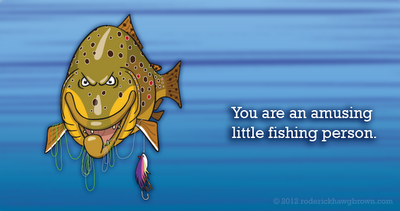 FR: Mr. Hawg-Brown- you seem to despise and disdain anglers, so how do you explain your popularity? RHB: Watch yourself–you’re putting words in my mouth. Let me clarify: I may have a general disdain for angler types, but I acknowledge, of free will, that without them I would be a shell of my present self. 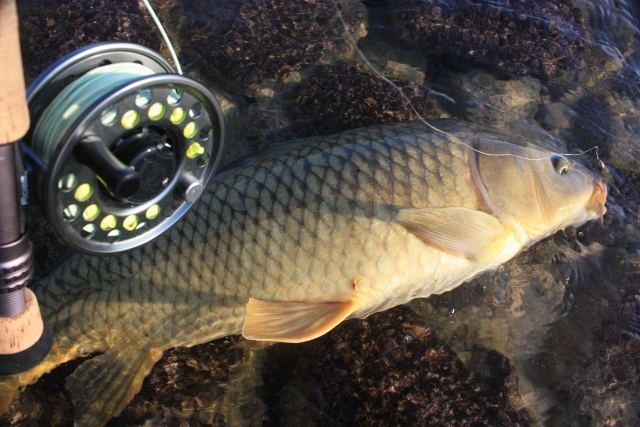 Think of it as a symbiotic relationship whereby anglers are the parasite, and I the host. Popularity? I’m not aware of any such thing. I believe if there is any widespread allegiance to myself it is more a reflection of the state of pathetic anglers than actual popularity on my part. That being said, I am a rather likeable chap. 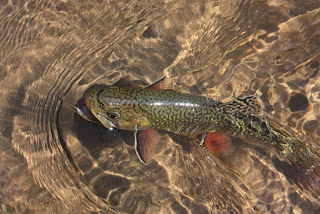 FR: You are frequently described as a pike in a trout skin- discuss. RHB: Before we get too far into this, you DO realize that you’re asking questions of a fish with a brain the size of a pea, yes? A cartoon fish, with a brain the size of a pea to be clear. Can you restate the question? I think that’s fairly self-explanatory so why go into detail? That being said I’ll indulge you because I realize you’re tying to fill space here; to shamelessly attract readers, if you will. You’ve heard of gender identity disorder? From the moment I was hatched from a gravel-covered egg I’ve felt confined by my relatively docile exterior. Inside lurks the spirit of a much nastier breed of fish than a trout. Because surgery is not an option, I live my life according to how I feel. I make apologies to no angler. I am who I am. FR: You were a world record here in Michigan, then Arkansas, then Michigan and now Wisconsin- would you say you are flip-flopper? 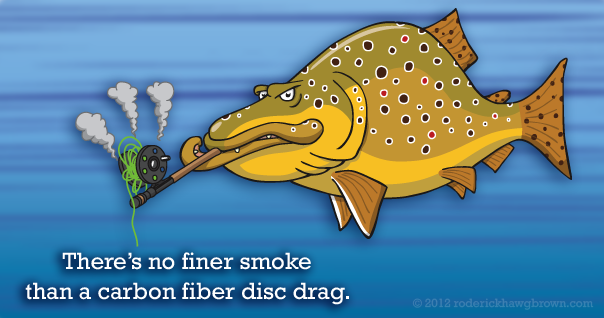 RHB: World records are merely circus sideshows; a label created by silly, insecure anglers for their sake without regard for the fish. I am who I am, where ever I go, and I speak the truth. What comes of that is what it is. I have no control over the matter. But yes, I’ve tipped a few scales in my day. FR: You seem to have a penchant for rodents? Is it the flavor, or do they just irritate you? Explain. And how do you get the fur out of your teeth? Just curious. Not that I eat rodents or anything. RHB: If you have to ask you wouldn’t understand. Actually, what I fancy most about rodents is that as they slide down the gullet, their tiny toenails scratch the inside of my digestive tract. They are the ultimate colon cleanser. That may be more than you had expected, but then again, you asked. Why would I want to get the fur out of my teeth? 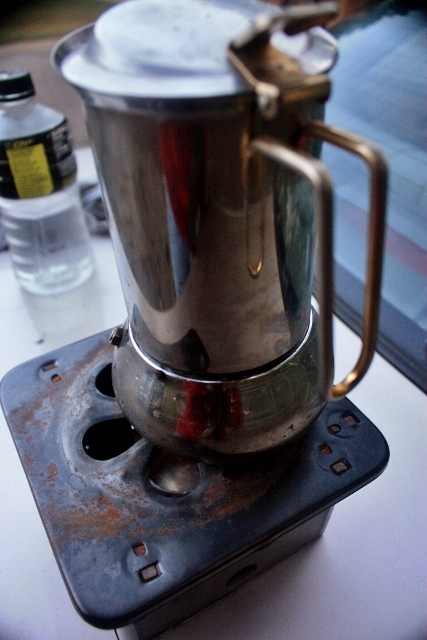 BTW, what is that boiling in the pot back at your campsite? Smells awfully familiar to me. Squirrel, by chance? FR: Let’s say it was a really nice day, the water was stained and high, and there were bugs galore hatching out- what would you absolutely hit? And could you please narrow this down to a specific dry fly? RHB: I’ve been known to bite the ankles of recreational floaters who dare to dangle their legs over the side of their Wal-Mart rafts. That’s about the only time I’ll rise. Dry flies, as you know, represent insects floating on or in the film. They are to be ignored. Too little return on the investment of energy spent. You were expecting me to say a March Brown? FR: You’ve been to such destinations as Patagonia, Iceland, Lake Michigan of course (is that a day spa for the Hawg-Brown clan?) Montana and Loch Levernochal- where can we expect to see you next? RHB: Kamchatka. I’ve been giving some serious thought to a life of anadromy. Decades of life in the stream have left me wanting more. I believe I’ll develop a taste for seal pups. Lake Michigan? Meh. FR: Mr. Hawg-Brown- you seem to be coming up through the world. What’s next? A play? Screenplay? Lunch with or as Warren Buffet? RHB: Again, my comeuppance is more something you anglers have pinned on me than anything I ever intended. Come what may, I shall take direction from no man, so a Broadway production is out of the question. Certainly my unwillingness to be a supporting cast member will cap my commercial success. But I have been written into a screenplay pitched to a Hollywood producer and will be featured in what you humans refer to as “apps”. It’s all very strange to me. Did you say buffet? I hope nutria is offered. 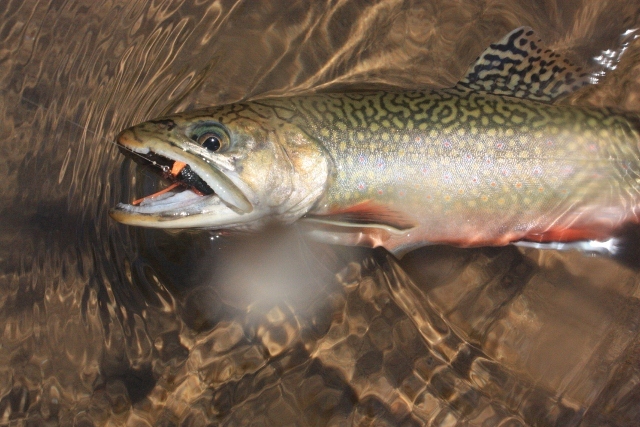 FR: On a regular basis you seem to want to eat streamers that look like rainbow trout. Is there some dynamic we should know about? RHB: No. I believe that speaks for itself. 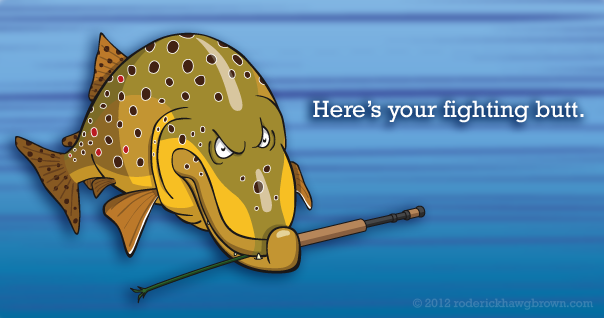 Rainbow trouts are the scourge of the earth. 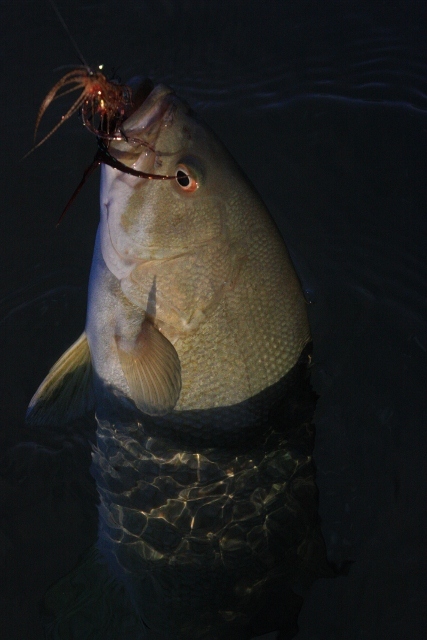 Thanks to hatchery managers and angler demand, those weak, neurotic and leaping fish have spread like the plague. I’m merely doing my part to keep them in check. Now, I know what you will say next: that brown trout are non-native in many waters as well. Let’s no go there. That’s a gentle warning. Next question. RHB: It’s not so much that I’ve conquered them. Fly anglermen are and always have been inherently weak, shaking and gibbering. I’ve simply exploited that. Except for Teddy Roosevelt. That man was cut from a different branch of the human family tree, and they don’t grow them like they used to. Admittedly, I fell victim to his offering, but I was young and had other things on my mind at the time. While I am not likely to make the same mistake at this stage of my life, I would recommend stainless steel leader. And protective goggles, because when that thing snaps, it’s coming back at you with great velocity and evil intent. I think we’re done here. At least I am. Fontinalis Rising agrees with the Teddy Roosevelt observation, but little else. I have since crawled back up on shore, removed the Babel Fish from my ear, and resumed my pursuit of Mr. Hawg-Brown. May he live for ever, and die a thousand deaths! Auu]]][[[ghh-ppphhhh#@! Translate that into Spanish. Yawn, stretch, scratch and sniff. It's Monday. With the Fall River bamboo firmly in residence, I thought I'd strum that accordion a little more. Let's have some coffee. This last week was quite the week for FR. I had to go downstate Tuesday on business, and wrapped it up in short order. This left me time to swing over to Schultz Outfitters in Ypsilanti, on the beautiful but low Huron River. The shop was occupied by the lovely and talented Katie Hambone Ferner. (In todays world of political correctness I must state that Mike Schultz is also lovely and talented, though his wife begs to differ.) I have suggested the French "Jambon" as an alternate nickname for Katie. Katie is an Alaska guide I'll have you know, currently way-laid by a shoulder injury. She seems to have found a home at Schultz Outfitters. I was told he had a guide trip, but as it happened, Schultzy was in the house, and we got to talk a bit. Katie and Schultzy helped me wade through their impressive inventory of tying materials, and would you believe they had everything on my list? A first in my experience- there's so many thousands of materials out there, that no one shop or outlet ever has exactly everything you need. Serendipity. Then through the combined miracles of cell phones and Facebook I found out that Lou Burhart, bamboo rod builder extraordinaire was on his way, and so I hung out for a couple of more hours. Lou is a character, a cad and a card in that order, and a hoot to hang out with. We talked awhile, he gave me a Brack Hill Tackle combat cap, and we parted ways. It was nice hanging out with Schultzy and Katie, telling stories, seeing the photos from Mikes hot-off-the-presses trip to Michigan's far-western UP for monster smallmouth (and some MONSTER pike), to shop leisurely for stuff I may not need until next summer (what was I thinking? but at least I'm prepared). The moment I left Schultz's I made a phone call to Becca Schlaff. "I'm on my way". She had told me some time ago that I should see her studio, and I'm glad I did. Becca is an amazing artist. Period. That said, I felt like a bit of a heel- I had contacted her ten days before saying that I might be down, but failed to follow up with definite information. To her credit she accommodated me last minute, and I'm so grateful. I got some amazing new insights into her work, and though I've been a big fan of Becca since first meeting her, to see her work space, and to be able to spend some actual time with her and her work gave me new insights. Thanks again Becca. That was Tuesday. Let's see, nothing happened Wednesday. Nothing happened Thursday. 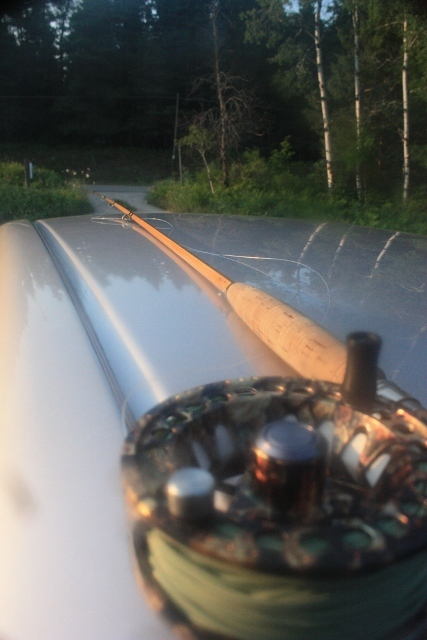 Oh, Friday I got notice that the bamboo rod from Fall River Fly Rods was here. Nothing gets your attention like that. I slept fitfully Friday night I can tell you. Saturday I awoke to an ugly radar screen and a full plate at home. I picked up the rod not long after the Post Office opened, but billowing winds and gray skies discouraged me from heading out straight-aways. I got a good nap in, and the ensuing outing I posted yesterday. Scroll down and read it. I took it out again yesterday up to the UP, with considerably worse results. The rod was superb, but the fishing stunk. It was scenic, remote, with lots of waterfalls and requisite scenery, sans fish. I caught one small fish, saw some real dingers, but hey, you'd be a big fish if you were the only one in a mile of river. I do have some cool outings in the coming week, so stay tuned. 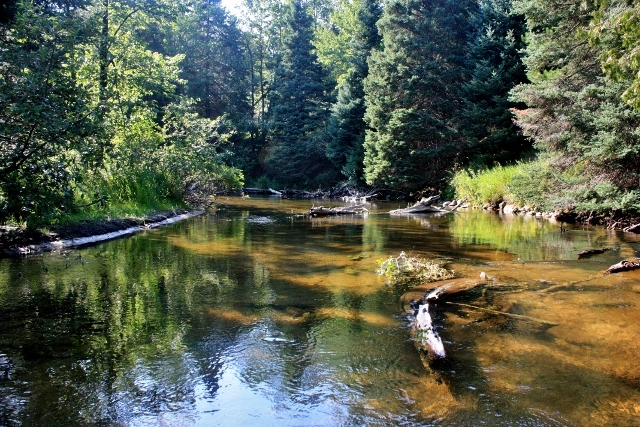 Wednesday I'll be fishing some very exclusive water on the Boyne River, and on the weekend I'll be fishing the North Branch Au Sable, perhaps with tying great Mike Schmidt of Angler's Choice Flies. I owe him money, so we'll see how this goes. Okay, coffee is done and gone. Gone I tell you. Let's get on with it. Oops. Let's get after it, my friends. 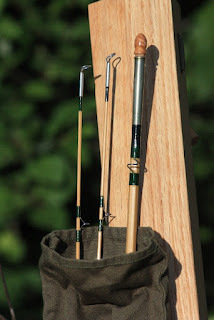 Several months back the Outdoor Blogger Network announced Fall River Fly Rods had built a bamboo rod for OBN, or more precisely, for 15 OBN members to test, fish, and blog about. At the end of this nation-wide circuit, one of the bloggers will be drawn to win the package. I am one of the privileged few. It arrived yesterday. This is our story. They say you can't judge a book by its cover (though that certainly hasn't stopped publishers now has it). I think I can judge this package by its cover. It's a black six inch tube well over 5 feet long, festooned with canceled stamps and postal tape, and best of all, stickers. Stickers of fish and flies, from Vermont, and New Mexico and Virginia. There is a fly rod in this tube, I just know it. It was kind of like Christmas in July opening this thing up. It held not only the rod and a reel from Montana Fly Company, but when I carefully removed these out fluttered a pile of other things it had accumulated along the way. Flies tied by the users. A journal. More stickers. Storms were piling up on Lake Michigan and so I carefully delved in. The instructions, oh the instructions. "Do not leave the rod in a hot car as this can soften the glue and ruin the rod". I'm paraphrasing. I tend to be rough on gear, I broke most of my rod tips last year, and the tip on this rod looks like a toothpick. A very beautiful toothpick. 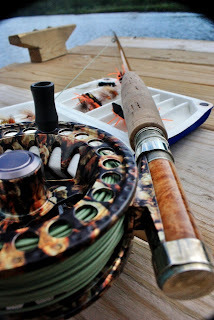 Don't worry, being that the rod isn't mine and worth more than all my other rods put together, I will be very careful. No riding around with the rod set up. No bringing the rod to work so I can fish on the way home (it's too hot). I've memorized the assembly and dis-assembly instructions. I'll hang it in my closet. 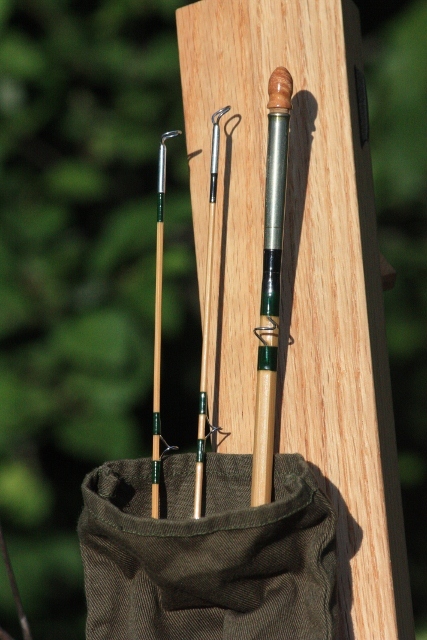 I got to hang out with my friend and bamboo rod builder Lou Burhart last week for a couple of hours. He assures me that if anything, bamboo rods, being solid and not hollow like graphite, are the tougher of the two materials. I took the rod down to Crooked River for a test cast. It has some considerable heft. I'm not laying the casts out quite like I'd like. A big late breakfast is laying heavily on me and the rumble of thunder is negating the thought of a trip. A nap is definitely in order. What greater luxury is there than a Saturday afternoon nap? I woke after a couple of hours feeling refreshed. One look at the sky and a glance at the radar confirmed what I needed to know. It was time to go bamboo. I made the 5 minute drive to the Maple river trying to drill the assembly instructions into my sleep-addled mind. "Hands together together, hands apart apart". It appears that half my gear is missing, the result of having to switch back to my spare waders. This rod is beautiful, the wraps are perfect. Tip O the hat to Mr. Zicha. I arrived at the input only to find another vehicle there, but after I wadered up and started walking to the bridge I see two young women in bikinis on the banks, swimming in the heat of the day. Ah, summer. The water is woefully low, I haven't seen it this low and clear since 1988, when it almost stopped flowing entirely. Fortunately it's not that low, and it feels cold to the touch, assuring me I won't over-stress the fish. Recent rains and cool days and nights have helped. At first I find this rod a little intimidating. It's expensive. It's a little heavier than I'm used to, though not heavier than my 8 weights. I'm not getting the rhythm. It's bamboo. Fish are scattering as I approach, and I see more scatter as my line flops on the water. Soon enough I reach a braided section of stream. 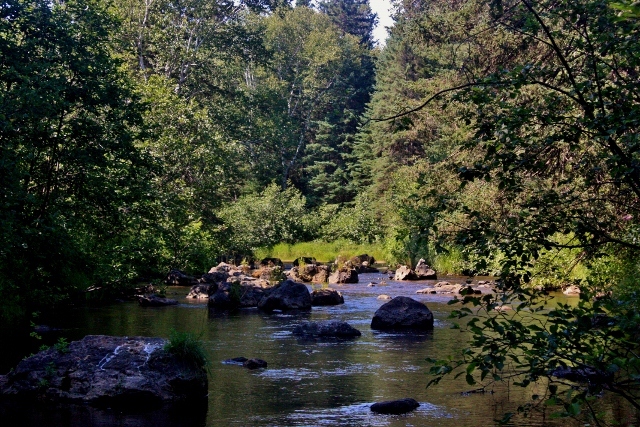 The pool below the confluence always holds a pod of brook trout. I concentrate hard on laying out a gentle forty foot cast. Sure enough, I get a slashing rise and a miss. 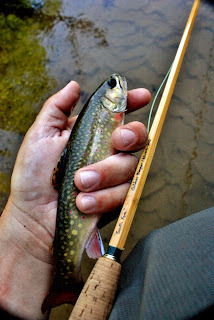 Two casts later I have a small but lovely brook trout in hand. Then another. I make my way upstream. Things are starting to fall into line. I catch about a dozen small fish, and later, an 8 inch brown and some small rainbows, baby steelhead actually, the Maple river slam. The conditions are tough, the light glary, and the water low, but after awhile I realize that I am no longer fishing bamboo. I am merely fishing. Bamboo rods are about traditions. The Maple river is my tradition. My grandparents lived on and watched after the land that is now a golf course, with about a mile of river flowing through it. We had exclusive access to this water back then and rarely saw other anglers here. I learned to fish and fly fish from my grandfather here. I learned about the Hex hatch. I swam with my brothers and cousins in the holes. I did my first night fishing here. 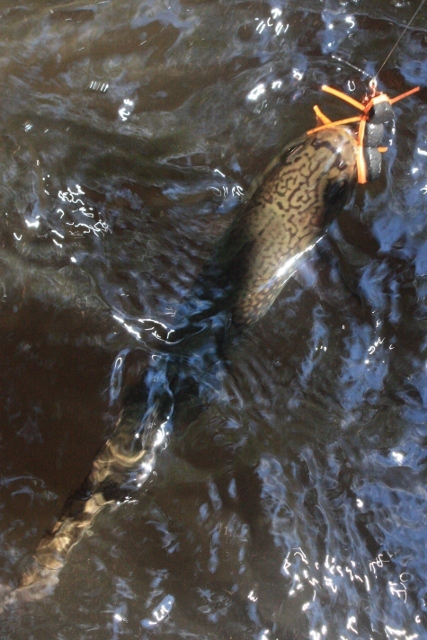 I caught my first trout on a fly just up stream and in sight of the restaurant. It is my tradition. My grandfathers ashes rest here. Somehow, being here in this changed but familiar place with this rod brings me back. It's pleasant to spend a leisurely afternoon, catching dinks, thinking of my grandfather, enjoying the feel and rhythm of a fine rod, catching fish. I've gone bamboo, and you can't save me. I tried to fish on Sunday. I say "tried" because there were so many obstacles, real and perceived, not the least of which was the fractious weather of the night before. As the sun had waned thunder storms popped up, rattling my place and drenching us with rain. There was no perceptible front approaching from the west when I checked the radar- all was quiet one moment, and in the next Lake Michigan had disgorged a band of storm that washed slowly over the Straits of Mackinac. Two hours later it happened again, and it proceeded to unleash these storms in waves until the light had once again turned gray. My sleep was restless, punctuated by flashing light, the sharp crack of thunder, or more constantly, the deep rumble of it, like a freight train trundling off into the distance, and occasionally, the sound of heavy rain pelting down on my metal roof, and the waterfall sound of it being dispensed with. Such nights make me restive, but for some reason I find them relaxing, blissful even. I awoke early Sunday morning and drank my coffee to the rumble of the last of the storms, my eaves still dripping. 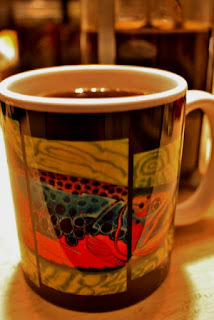 I had fished all night Friday without success, arriving home at around 4 a.m., sleeping until ten, a leisurely breakfast, then the balance of Saturday was spent writing. Scribble scribble. I had intended to fish for brook trout Saturday evening, but the threatening skies and an unfinished paragraph had discouraged me. I'll fish tomorrow. Sunday I awoke to a wet world, stifling humidity and building heat. I also awoke to that same pile of laundry and stack of dishes. I dispatched the domestic chores, tied a couple of flies, and by early afternoon made my way to some new brook trout water. The next problem would be that full night of rain. I checked several local river gauges online and sure enough, they all had a significant spike to them. 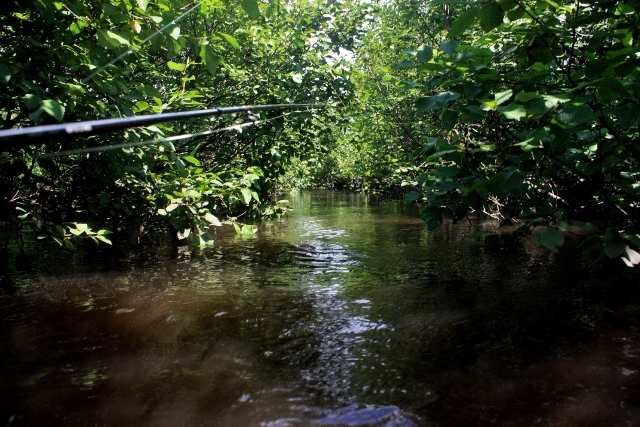 I went to a stretch of river I have only fished once before. It is beautiful, choked, darkly stained, and difficult to access- perfect brook trout water. I bumped along the narrow track, grateful the gas drillers had filled the low spots with crushed rock so I could get through. When I finally arrived, literally at the end of the road, there was nothing but heat, a couple of deer flies, and a rustic stairway leading into the water. When I looked the water was lapping the step and very dirty. It was also quite cold. 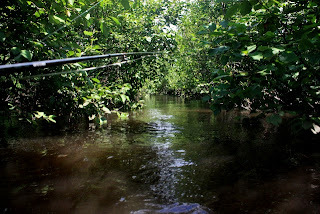 For the first half mile I hardly fished at all, the river a virtual tunnel of tag alder. You wind your way up, over and through it, trying not to be swallowed by the blackness of the water. My few casts were of the bow-and-arrow type, shooting my fly into the few lies I could find, or more often, into the branches. 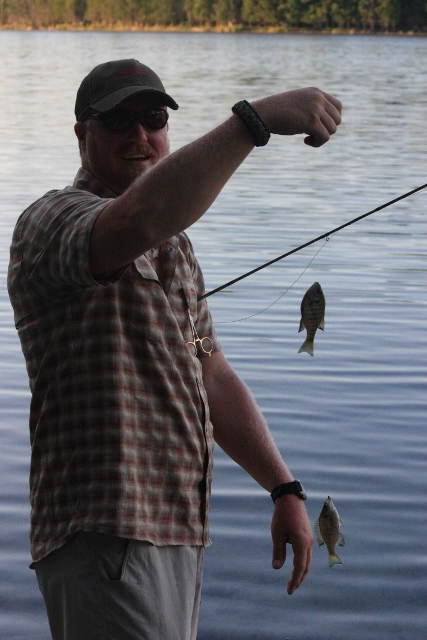 I did manage to catch one fish, and miss two others, all at close range. I found some very promising water, including a couple of holes that nearly swallowed me, but in the end the heat, high water and lack of fish made me think of other things I could be doing. After all, I live here- why beat myself up on a bad day? I'll come back next week, or some evening after work. I then broke a cardinal rule on this particular river. Two weeks prior I had explained to an Ohio angler that we don't get out of this river and hike back to the vehicles. We make an about face and walk back down the river. The reason is simple- it's set in a wide flood plain choked with tag alder, a maddening jungle of sharp grass and thick brush, nearly impenetrable. But no, I actually climbed the banks and for the next half hour I stumbled through this maze, the visibility measured in feet, the grass head high, turning back often at the walls of brush and downed trees, trying to keep the sun just over my right shoulder as a bearing. At last I gratefully stumbled out into open forest, I turned north and headed back on a game trail. The rank livestock smell told me that a herd of elk had come through recently, this morning as a matter of fact, as the night's rain would have washed the area clean. 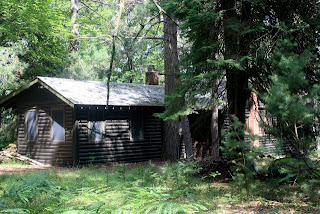 I soon came to a lone log cabin set in the pines, someone's hunting camp, pristine, with a red brick chimney, which I liked for the fact that red brick is hard to find in Northern Michigan. It looked abandoned, except for the whiteness of the split logs on the wood pile which whispered "we have been here". Regardless of its state now, this cabin will be occupied come November, I guarantee it. "I knew the rivers were blown and dirty, I knew it was hot, the bugs bad and the road long." What is the point you ask? I went just to go, to be there- to be. I knew the rivers were blown and dirty, I knew it was hot, the bugs bad and the road long. 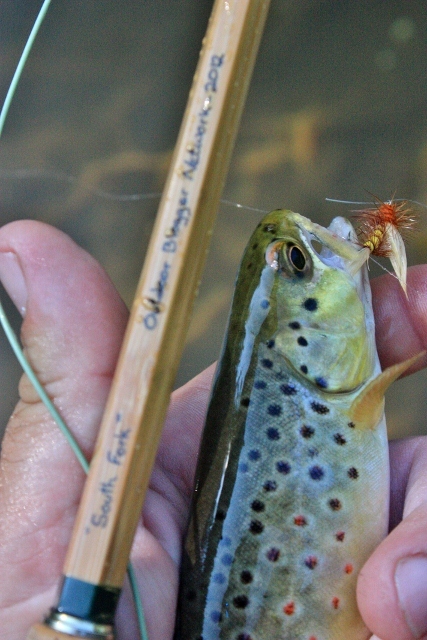 I just needed to be out there, to curse the tag alders, to see one little trout glistening in my hand. I needed to stumble through that swamp. I needed to smell the scent of young bull elk mingling with that of green ferns and hot dead leaves. 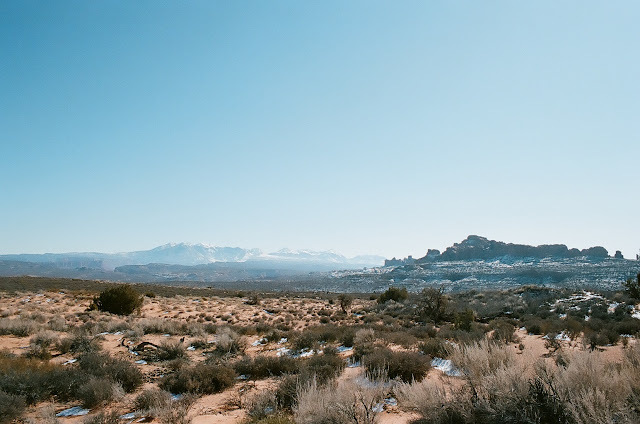 I needed to see that cabin, to imagine what it is like to come up here and get away, to have all of this be fresh and new, the place where you caught your first brook trout, or shot your first buck, saw your first bull elk, rutting, muddy, red-eyed and hoarse from bugling. 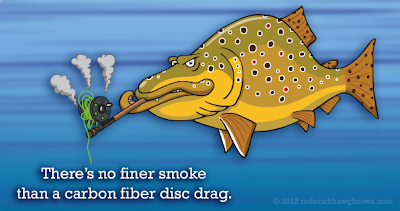 Fly fishing isn't about catching fish, or being a great caster, or even about knowing how to tie flies. It is about experiences and flavor, it is about living life in intimate contact with the natural world; of touching, breathing, smelling and etching deep into your mind what it is like to be out there, exploring our home. A couple of months ago when MidCurrent advertised that they were looking for a couple of interns, I entertained the thought and made some inquiries. I decided that I was unable to make the time commitment, but MidCurrent publisher Marshall Cutchin asked if I would be willing to submit creative work from time to time. Last month they published a short piece called "The Hexes are Coming!" and now this week they featured in their weekly newsletter my latest piece. Here's the opening. I’M FRANTICALLY TRYING TO RETIE. I have my fly in one hand and my curlicued leader in the other. A sharp pain on my elbow signals yet another deer fly bite. Several more are circling, landing on my hands and buzzing my hat brim, making life miserable. Sweat is running off my nose, leaking from under my hat, down my neck and face. I’m just as wet inside my waders as out, as this is one of the hottest days of summer yet. 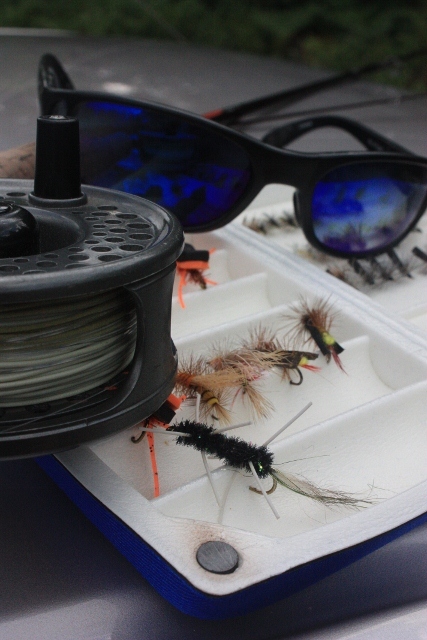 After an interminable time spent tying on this one lousy fly I’m ready. Except that while tying, swatting and sweating I’ve managed to wrap my fly line in the nearest tag alder and now this must be untangled while simultaneously waging war on the deer flies. I’ve started my own personal deer fly hatch. I hope the brookies appreciate it. Please go to Midcurrent to read the rest. It's one of my best. Here's the link. Yawn, stretch, scratch, sniff, open left eye first. Is it okay to get out of bed? No choice, I have to leave for work in an hour, so I stumble to the kitchen and set the electric kettle to work, boiling water for our coffee. I'm going to drink a quart, so I don't know what you're going to do. I got to looking at this site this weekend and realized it has gotten pretty sparse as of late. What can I say? I've been working, fishing and writing. I've also taken a bit of a hiatus here. When blogging feels like work it's time to step it on back. I have been enjoying my summer- the fire, the heatwave, the insanity of the tourist season, my frenetic fishing between jobs, the successful release of the book by the Boyne Writer's Circle, grilled vegetables, light-seeking bugs in my house at nights, a couple of long drives in search of something not fish, and visits by new friends and old, some of whom I didn't quite connect with. Beaver Island is everything you have read and more. I'm planning on spending a week next year, though mostly to write. With spotty cell service, worse internet, and a long trek back to the mainland, I can't think of a better place in the continental US to escape to. What? Are you grunting at me? At this hour in the morning? You want me to shut up and show you fish pictures? Even though I Facebooked most of them? Very well- here's half my summer in pics. First- this was my one and only Hex fish. Tom Hazelton took the picture. I felt so guilty- I was trying to get him into a fish like this, but he kept insisting on taking turns. If you look close you can just make out the trees back-lit by lightning. 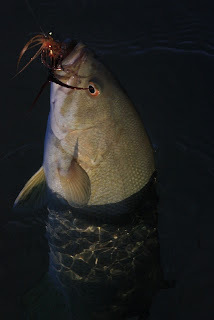 This was another fish with Tom, only he was two reefs away, and I had to shoot it myself. I've fished brook trout with Alex Cerveniak and on my own, and I've made my way back to my flats and found fish galore. Never the ones I'm seeking, but always something to keep it interesting. I have bass finger. Bad. Don't ever stick your finger in a bass' es is es es' mouth. I have these purple bruises where healthy skin should be, as if they start digesting those gobies the moment they strike. I'm serious- the skin is rough, and I have been in pain all day. Okay, so I'm a wimp. A purple-fingered, sore-elbowed wimp. I love smallmouth. "ya, I am a sumo bass"
What should you expect here at Fontinalis Rising? Well, I have on tap an interview of guide Kelly Neuman along with some streamers to give away, and I have a review of Redington's Sonic Pro Zip-Front waders. Yes I like them, and I have more stuff to give away then. If you like my creative work, then check out the Green Issue of Blood Knot, and I have to say that I posted this hastily to have some fresh material up, as I have an article being featured on MidCurrent today. I think it's my best piece ever, so be sure and check it out. It will be in today's newsletter. Okay, the carafe is empty and it's time to go to work. Have a great week.